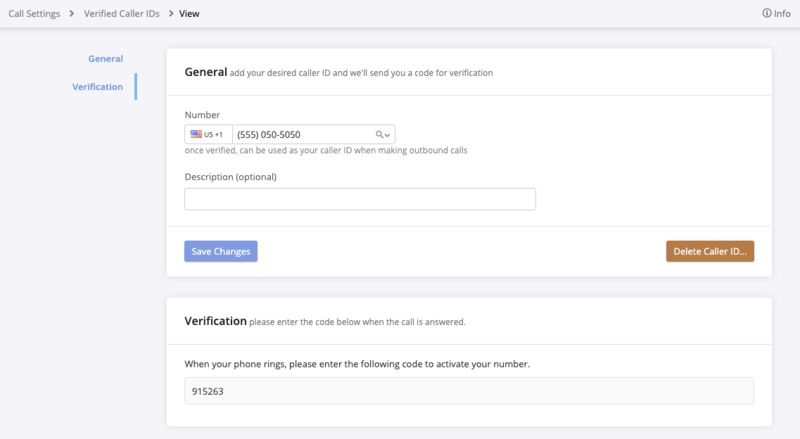 Adding verified caller IDs allows you to use your own number (such as your mobile number) rather than a tracking number in your account as your outbound caller ID. When you add a new number, an automated phone call will be placed to that number and you will be prompted to enter a verification code shown on your screen. 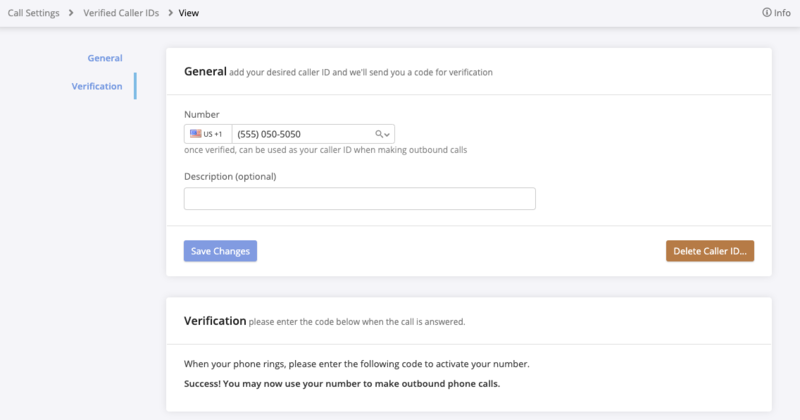 Verified caller IDs are not ported to CallTrackingMetrics and cannot receive inbound calls in your account. If you wish to convert number into a CTM tracking number, click here for more information. Navigate to Numbers → Call Settings and click edit next to any call settings configuration. Click or scroll to the Caller ID section, then click Verified Caller IDs. If you do not already have a verified caller ID in your account, you’ll be taken to a new setup page. Otherwise, click New Verified Caller ID in the upper right corner. Enter the number you wish to use and click Verify Number. Make sure you are able to answer a call on that number before clicking the button. You will receive an automated call at the number you entered. When prompted, enter the six-digit verification code shown on your screen. When you have successfully verified your number, you may end the call. The screen will update to show that the number has been successfully added. If your softphone settings allow you to choose your outbound number, you can select from any of your verified caller IDs when making an outbound call. If you wish to use verified caller IDs, review your account’s settings to ensure agents are allowed to select which numbers are used for outbound dialing. You can verify these settings by navigating to Settings → Account Settings and clicking or scrolling to the Behaviors section. Ensure both of the following caller ID options are disabled. You can review or remove verified caller IDs at any time by navigating to the Verified Caller IDs page. This page will list all verified caller IDs that have been added to your account. To remove a number from the list, click edit next to the number, then click Delete Caller ID and confirm.